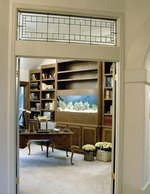 Aquarium decorations make fish tanks look attractive because they add details and color to the plain glass container. When the decorations sit in the fish tank, they can become dirty and covered with algae. Algae appear green in color and can make your fish tank look unattractive. The fish tank decorations need cleaned carefully to protect the health of your fish or sea creatures. Improper cleaning or the addition of chemicals to the water can cause the fish to become ill or even die. Remove the fish tank decorations that are covered with algae. Scrub the decorations with a stiff bristle brush under lukewarm running water. Pour nine parts of water into a bucket with one part of chlorine bleach. Soak the aquarium decorations in the bleach solution for 15 minutes. Drain the bleach solution from the decorations. Soak the aquarium decorations in clean water for another 15 minutes. Rinse the decorations under cool running water. Allow the fish tank decorations to air dry for two to three days. Place the decorations back into the fish tank.